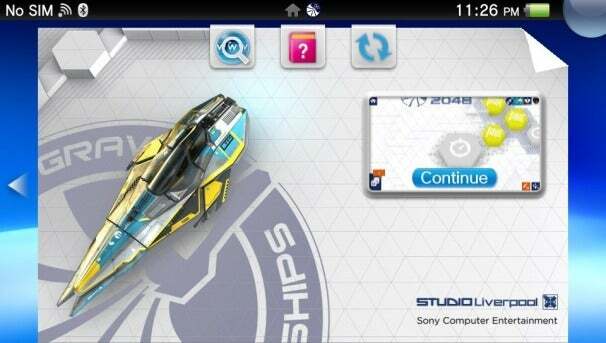 The WipeOut 2048 LiveArea looks fantastic on the Vita's 5-inch OLED screen. When you turn on your Vita for the first time you’ll need to log into the system with your Sony Entertainment Network account, or create one if this is your first Sony device. Choose carefully, because you can’t switch between multiple SEN accounts without formatting the Vita’s onboard memory. 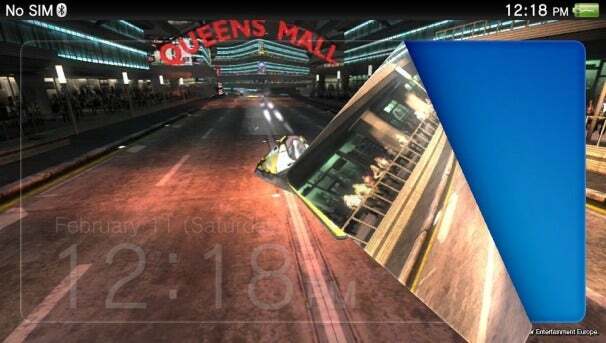 The touch-based Vita OS requires you to "peel back" the lock screen (seen here with a WipeOut 2048 wallpaper) to access the Home screen. Once you’ve configured your system language and time zone you’re presented with the lock screen, a ticking clock atop what appears to be wallpaper; tap and peel the lock screen away to access the Vita home screen. The Vita dispenses with the venerable Sony XrossMediaBar (XMB) interface that graces the PS3, PSP and select Sony HDTVs in favor of a new touch-based interface. It pins up to ten application icons to a series of pages that you can scroll between by swiping your finger up or down the screen. Tapping an icon will open that application’s LiveArea, a sort of middle ground between the Vita home screen and the actual application where you can accomplish application-related tasks like adjusting settings, reading the digital manual or checking for software updates. You can have up to six LiveAreas running simultaneously, though Sony may increase that limit in a future firmware update. While you’re likely to spend the lion’s share of your time with the Vita playing games (which can be either downloaded from the PlayStation Network Store or installed directly from a Vita cart) the device also offers a robust suite of applications. For the full rundown of system software check out our guide to what you need to know about the PlayStation Vita. In brief, there are built-in apps for sharing game activity or chatting with friends, watching movies, playing music and viewing photos, as well as a Content Manager application for transferring files back and forth between the Vita and your PC. To transfer files you’ll need to install the Content Manager Assistant software on your PC. It seems a little silly to require Vita owners to use proprietary content management software instead of just treating the Vita as an external USB drive, but the Content Manager Assistant software is simple to use and may help stem Vita software piracy. Of course to actually store media on your Vita (which only has 512 MB of onboard RAM for running system software) you’ll need to invest in a proprietary PlayStation Vita memory card, which (at the time of this review) are ridiculously expensive. Our Vita review unit came with a 16 GB memory card, which currently retails for $59.99. If you’re strapped for cash you could pay as little as $20 for a 4 GB Vita memory card, but if you want enough space to store more than a few songs or saved games (some Vita game cards allow you to save data directly to the card, but not all) you could spend as much as $100 for a 32 GB Vita memory card. These prices are tantamount to highway robbery, especially given that a standard 32 GB SanDisk SDHC memory card costs roughly $30. Sony’s decision to design the Vita to use a proprietary format of external memory and then charge inflated prices for Vita memory cards is a blatant bit of profiteering that directly harms the consumer, besmirching an otherwise laudable piece of gaming hardware. There’s also a built-in web browser that functions reasonably well. It utilizes touch for navigation and onscreen keyboards for text entry, and resembles an oversized Android browser. The Vita browser supports neither HTML5 nor Flash as of this review. Color/contrast shot taken with the Vita's rear-facing 0.3 MP VGA camera. The PlayStation Vita has a pair of front and rear-facing 0.3 MP VGA cameras, and they’re both terrible. During testing the Vita regularly captured photos that appeared blurry and dim with poor contrast between light and dark areas. The Vita 1.6 firmware update added a video recording feature to the Camera app, but the quality of video captured using the Vita’s cameras is equitably poor. These cameras work well enough for playing the occasional augmented-reality game, but for snapping photographs suitable for sharing you’re better off using a dedicated camera, or your smartphone. Color/contrast shot taken with the Vita's off-center front-facing 0.3 MP VGA camera. Gross. The PlayStation Vita packs a quad-core PowerVR Series 5XT SGX543MP4+ GPU that’s similar (though superior) to the dual-core SGX543MP2 GPU which powers the Apple iPhone 4S and iPad 2. The Vita’s GPU does a fantastic job of rendering movies and games without a hitch; during testing we played several graphically-demanding Vita games (including Uncharted: Golden Abyss, Lumines: Electronic Symphony, Super StarDust Delta and Ultimate Marvel vs. Capcom 3) and they all looked fantastic, with nary a dropped frame or graphical glitch to speak of. The Vita also boasts respectable battery life, and during testing we were able to eke out just under five hours of fun playing games, watching movies and listening to music at maximum brightness and maximum volume before our Vita review unit ran out of juice. Thankfully it only takes about an hour and a half to completely charge the battery via the AC adapter. While our Vita review unit included a 3G radio, we were unable to assess the performance of the AT&T 3G on Vita units at the time of review without a compatible 3G SIM card. Once we have thoroughly tested the 3G functionality of the Vita we will update the review accordingly. All told, the PlayStation Vita is an excellent handheld gaming console that’s worth paying for if you demand more from your mobile gaming experience than smartphone or tablet games can provide. You’ll have to make some sacrifices in order to play with this kind of power, but if you’re willing to accommodate the Vita’s size and Sony’s draconian memory card pricing scheme, you’ll be rewarded with one of the most powerful handheld gaming devices ever made. Rear touchpad works well, permits unique gameplay. Light and durable design with excellent controls. Onboard 0.3 megapixel cameras are terrible.